The friction units often work in conditions when the speed of movement of surfaces periodically changes direction. At that during some periods of time speed of movement of surfaces becomes small, and during some moments of time accepts zero value. Calculation of thickness of a lubricant layer during these moments of time is of great importance, as during these moments of time there can be raised wear of surfaces and even damage of friction unit. In this paragraph transients in EHD contact of cylinders which angular speed of rotation changes under the sinusoidal law are considered. During time periods when rolling speed is small, the thickness of a lubricant layer has two local minima, and in the end of the period of braking of bodies the global minimum is located near the contact inlet, instead of the contact outlet. 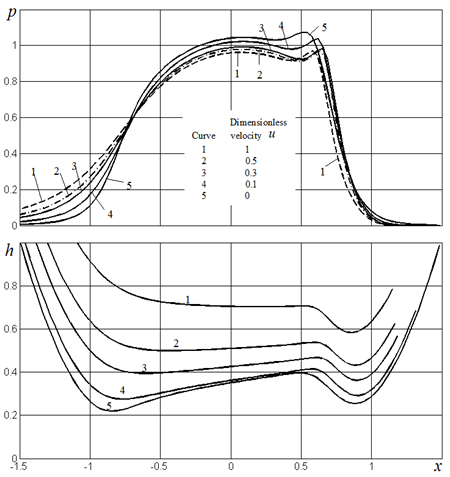 At the moment of time when rolling speed takes zero value, bodies are divided by a lubricant layer, and speed of rapprochement of surfaces in the field of a high pressure is close to zero, and has two local maxima. One of these maxima is located near the contact inlet, and another maximum is located near the contact outlet. At the moment of change of direction of movement the contact inlet and the contact outlet change roles, and reconstruction of the form of a clearance is carried out by wave process. Let's consider rolling of two elastic cylinders divided by a layer of lubricant. Lubricant is modeled by viscous compressed Newtonian liquid. For the account of change of viscosity of a liquid with pressure change we use model of Roland (1.19). We believe that the load pressing bodies to each other does not change in due course, and rolling speed changes as follows. Till the moment of time rolling speed was constant and equal , and processes in EHD contact were stationary. Since time moment , rolling speed changes as follows: where , is the frequency from which a direction of movement of surfaces of cylinders changes . where the density and viscosity of greasing depend on pressure under formulas (1.18), (1.19). Functions and , defining the zone of a gap filled with lubricant, should be either are set, or should be defined from additional conditions. One co-ordinate is defined by conditions of giving of lubricant in a gap. We will consider a mode of flooded lubrication. This mode can be modelled as follows: if ; if , where value should exceed the size of contact zone calculated under the theory of Hertz considerably (not less than in 1.5 times). 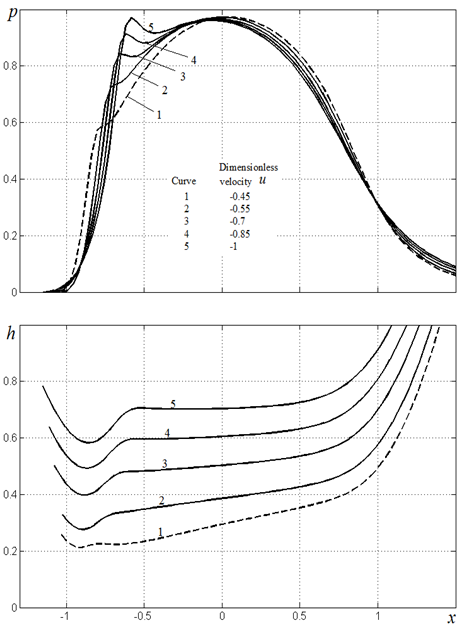 The values of co-ordinates if and if are necessary to define from conditions of destruction of a lubricant layer on corresponding border and removals of lubricant from a gap. We consider a case . At the initial moment of time the outflow boundary of a lubricant layer makes small moving with insignificant speed. During this period of time it is possible to use a usual condition: However when rolling speed becomes small, the moving surfaces have not time to carry away the lubricant which is squeezed out from a gap. As a result lubricant fills free space between bodies and speed of movement of boundary increases. During some moment of time it becomes more speed . If , the condition leads to occurrence of negative pressure in outlet zone. It means that the given condition becomes not suitable. Here is the unknown function accepting values in an interval . Important property of a condition (5.1) on boundary is the continuity of a derivative concerning speed . Results for a case are presented below. As the condition is carried out only during very short period of time in the end of the braking period when rolling speed is close to zero the influence of this function on the solution is insignificant, however its introduction allows excluding negative pressure in the solution. The case is considered similarly. Let's lead system of the equations to a dimensionless form. For this purpose we divide pressure into the maximum pressure at dry contact of the bodies, counted under Hertz theories, the linear sizes - into semi width of contact at dry contact of bodies, time - into the time for which at movement with a speed there will be passed a way : . Thickness of a lubricant layer we divide into the relation , viscosity of lubricant we divide into viscosity , and speed - into . Dimensionless variables we will designate the same symbols, as dimensional variables, stipulating each time, in what variables the equation or system of the equations is written down. The sizes concerning an initial steady state, we designate an index below. In a case of given conditions can be written down by analogy. The system of the equations and conditions (5.2) - (5.8) can be solved by a method similar to a method of the solution of simpler problem, considered in work . 2. The analysis of results. On fig. 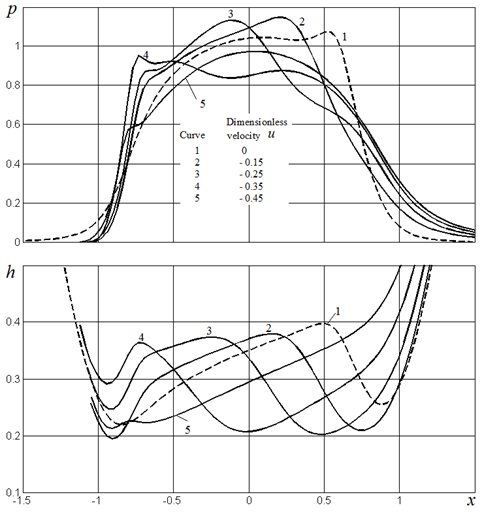 5.1-5.3 dependences of dimensionless film thickness and dimensionless pressure on dimensionless co-ordinate are presented at various values of dimensionless speed . The results presented on fig. 5.1, illustrate, as the distribution of pressure and film thickness in the zone of contact changes with changing of speed from the maximum value to zero. During the initial moment of time the film thickness has a minimum near the contact outlet. As rolling speed decreases the thickness of a lubricant layer also decreases, at that in entrance of a gap the falling of a thickness occurs faster, than in other areas. As a result on the graph there is a second minimum. At the moment of time when rolling speed is equal to zero, this minimum below first minimum. At reduction of rolling speed from its initial value the pressure in entrance of gap falls, and in the zone of a high pressure it increases. Thus character of dependence remains former. That is the graph has two maxima during all period of falling of rolling speed to zero. On fig. 5.2 the graphs of dependences and during the various moments of time after change of a direction of movement of rolling speed are presented. In time which moments are displayed on fig. 5.2, there is a transformation of the form of a gap and function of distribution of pressure. At that the minimum value of a thickness of a lubricant layer changes slightly. During the following period of time, which moments are displayed on fig. 5.3, the thickness of a lubricant layer and pressure distribution increase to their stationary value at speed . During this period of time pressure changes considerably in the field of the second maximum of pressure which is located now more to the left of the basic maximum of pressure. In other domain of a lubricant layer the pressure changes slightly.